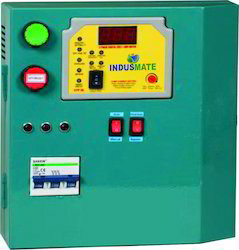 We are a leading Manufacturer of three phase dol starter with analog ammeter, three phase dol pump starter digital auto switch, dol mobile starter, three phase electronics starter dol and three phase dol pump starter from Ahmedabad, India. Phase reversal / wrong phase sequence. Phase to phase voltage unbalance. On delay timer for one minute for an auto start for power failure and SPP faults. Thermal overload protection ( range as per HP ). Remote sensing electronic dry running protections. Site selectable dry run trip setting from 75 to 95 % of set pump current. Round type Voltmeter and Ammeter to know site voltage and current. Site selectable auto / manual / bypass facility. Widest working voltage ranges from 250 to 500 volts. Contractor and thermal relay. For long life and to withstand high inrush current and spikes. Specially made heavy duty 16 amps L & T type AC coil contactor & thermal relay. For long life and to withstand high inrush current and spikes. Ultra bright indicators for all faults. Color coded ISI grade copper wiring with lugs for longer life. Compact, vermin proof, rust proof mild steel powder coated panel box. Optional – Model – KSI 33 MINI + WLC with two tanks automatic water level controller. Extreme high current (EHC) or short circuit more than 24 amps. Graded internal setting for overload tripping as per current range. High / low voltage with Auto Start. Fully automatic two tank water level controller. DOL Starter up to 7. 5 hp with specially made heavy duty 16 amps L & T type AC coil contactor / or 30 amps dc coil contactor. Dry run bypass facility with digital display. Calibrated Digital Ammeter 0.5 to 26 amps ± 0.2 amps Accuracy. Site settable Dry run auto start timer from 10 to 720 minutes with timer OFF facility. In built time compensation due to power failure during dry run auto start timer i.e. timer will start from same time once power returns. Site selectable unit bypass facility. Three pole MCB of 32 amps for short circuit and act as main switch. R, Y, B Indicators for three phases. Water level control is universal ie can be connected to float / magnetic switch or metal sensors. Emergency bypass for water level controller. The "INDUSMATE GSM WIRELESS MOTOR MANGEMENT" is intelligent and flexible motor management system. It offers comprehensive motor management including extensive protection, monitoring and control functions. With easy to use operation and on-site diagnostic data helps us to carry out predictive maintenance and GSM Technology based operations. This has Dual core microcontroller and GSM SIM based technology which is unique, reliable, and cost effective and continues to monitors all parameter and applications simultaneously at all the time and there is no delay in any fault condition detection, monitoring and providing safety. 2. 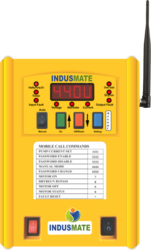 Dial the GSM SIM card inserted in the unit and use voice interactive service. 3. By sending SMS to unit to do /set all the parameters. INDUSMATE GSM DISPLAY DISPLAY SIM uses activated SIM card from any GSM service provider which communicate with server or any mobile phone. For example system is installed and connected to motor than it continuously monitors/ protects every activity of motor at site and sends all data to the web server / website or any mobile phone by SMS on real time basis. This has VOLTAGE SENSING technology so motor is protected up to STARTER terminals. Phase failure / loss from supply side. Electronic overload ( site selectable). Remote sensing dry run / No load current ( site selectable). Pump current setting can be done through SMS, Mobile phone onsite. Dry run setting from 75 to 95 %. Dry run bypass facility by SMS / PHONE.Site selectable Auto / Manual operation switch. Suitable for DOL, Star-Delta Starters. 4 Digit Password protected operation. Talks verbal information in required language. 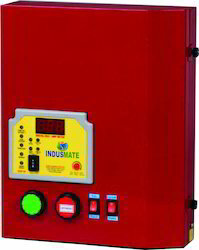 Works on wide voltage supply (225 to 500 V). Facility to check network communication between GSM SIM and dialer phone. No call charges when power is absent. Auto call disconnect facility to save call charges. Motor ON and OFF switch on unit. Switch for Easy bypass and network checking. Phase reversal / wrong phase sequence from the supply side. World class MCU and software which is highly faulted tolerant to noise and Electromagnetic interferences and noise from the motor, starter etc. DOL Starter up to 7. 5 hp with Katee make heavy duty air sealed 40 amps DC coil Contactor separate for each phase for long life. Pump current setting range is 2-16 amps. Calibrated Digital Voltmeter with 100 to 500 volt ± 2 volts. Accuracy. Calibrated Digital Ammeter 1 to 26 amps ± 0.2 amps Accuracy. Scrolling Ammeter for R, Y, B, phases. Scrolling Voltmeter for RY, YB, BR, phases. Inbuilt memory to show last setting value. On-site AUTO FAULT DETECT (AFT) for AC voltage, LEDS, Display, Relay, etc. Digital display for the countdown timer. On delay timer for one minute for the auto start for power failure and SPP faults from the supply side. Widest working voltage ranges from 180 to 500 volts. 32 AMP 3 Pole C SERIES MCB for main switch and short circuit protections. Three Phase 4 wire Energy meter HPL make for measurement. The unit has heavy duty ON – OFF, Setting, and Auto / Manual switches. 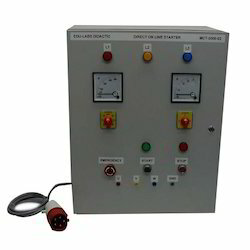 Eliminates the need for separate DOL starter, auto switch, voltmeter, and ammeter.